Our phones are ringing off the hook today! I am guilty too, haven't nearly gotten all my Christmas shopping done yet...and Christmas is next Tuesday! 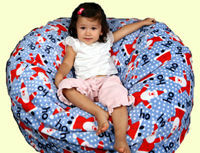 Everyone is asking if they can still get a bean bag chair from us for Christmas. Well, the answer is yes and no. It depends what state we need to ship it to. As of today, Tuesday December 18, If you live in these states, we should be able to get a bean bag delivered to you if you order today before 4pm Eastern Time. FedEx comes to get our packages at 5pm every week day. Keep in mind, though, that we build in a day of "buffer", in case FedEx runs a little late. FedEx works Christmas Eve, but we don't like to count that day since they get so busy! So, if you really want to know if we can ship a bean bag to you before Christmas, give us a call or email. We can often push orders out the door the same day they are placed, which means there's still a chance even if you don't live in any of the states above. * = some states can fall under 2 transit times, depending on the zip code. Just keep in mind that once the bean bag leaves our hands, it is up to FedEx at that point, and they do not guarantee Christmas delivery. This year, they have been really good about delivering on time though! I would also venture to say that if your children really really want bean bags for Christmas, I'd bet they would be willing to get them a day or two after December 25. I know if given the choice of not getting one or waiting just a little bit, my daughter would choose to wait! If you decide to do this, print out a picture of the bean bag they will be getting, wrap it in a cute box, and stuff it in their stocking! An IOU for a bean bag chair! Or, print out a few selections and tell them they can choose. Better yet, leave it wide open and print out the homepage and tell them they can browse the entire selection on Christmas Day and choose! Now that's going to be a fun time watching them marvel over all the different bean bags we offer! And the best thing about it is you don't have to stress and guess which style they would like best! So, let us know if we can assist either shipping now to arrive in time hopefully, or creating an IOU that will delight on Christmas Day!